The Photographic Elephant. A funny animated story for kids. There was once an elephant who wanted to be a photographer. How his friends would laugh when they heard him talk about it! - "How silly," said some, "there aren't any cameras for elephants!" - "What a waste of time," others would say, "there's nothing to photograph here anyway..."
But the elephant kept following his dream, and, piece by piece, he managed to cobble together some old bits of junk and some spare parts, and ended up with a camera of sorts. With this camera, the elephant had to design practically everything himself, from a button he pressed with the end of his trunk, to a lens made to fit an elephant's eye, to a load of wrought iron used to make a frame so the elephant could attach the camera to his head. But things worked out differently. The sight of the elephant walking about with the camera on his head was so funny that no one could help but laugh when they saw him. 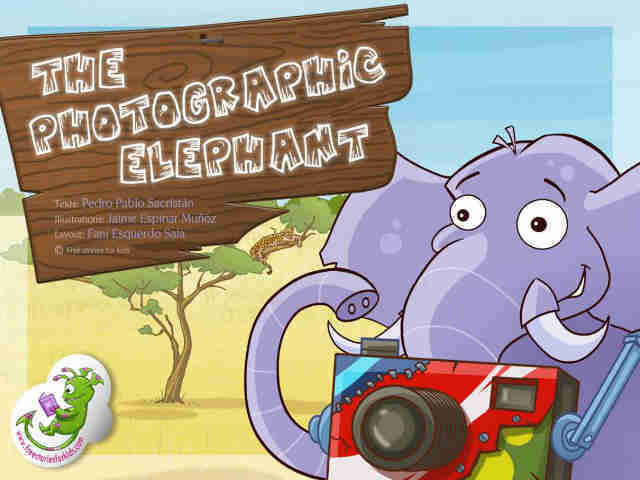 And, using a great deal of good humour, the elephant managed to take some really amusing, incredible pictures of all the animals. In his photos they always looked joyful; even the moody rhino! So the elephant managed to become the official savannah photographer, and animals would come from every direction to have some nice photos taken for their passport to the zoo.